One of the things that we are continually working to improve is turf quality. 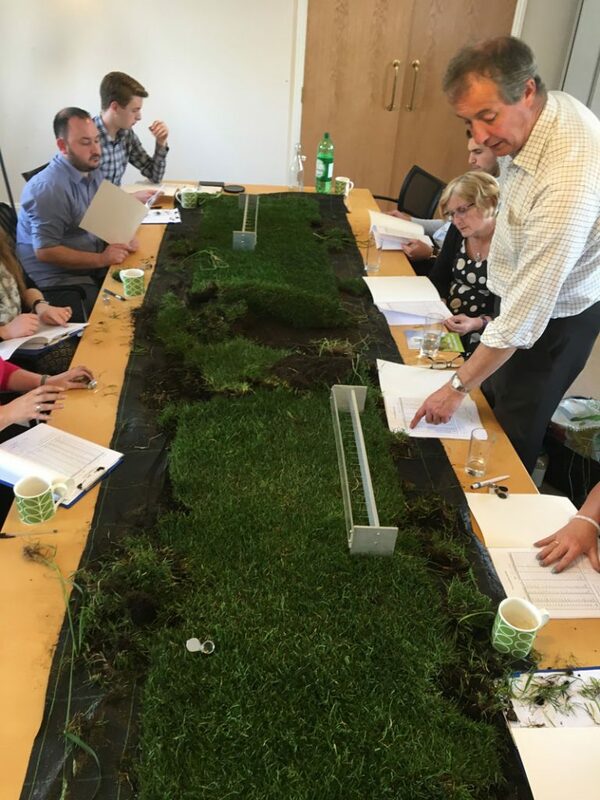 This month, our production, harvesting and sales teams have been brushing up on the TGA Turf Quality Standards. Consistent and reliable quality are important in any industry. When you are working with plants, it’s difficult to measure quality other than by eye. That’s not necessarily helpful to the buyer because he or she is unlikely to visit the turf farm and pick out the rolls he wants. It’s just not practical. So for the turf grower wanting to describe his product accurately and objectively, it’s vital that quality can be measured and recorded. For turf specifiers and buyers, that measurability and accountability allow them to make educated decisions when choosing a supplier. The TGA Standard for Turf Quality was created in 1996. It’s easier to interpret than BS3969 and it was devised by turf industry experts. The British Standard was compiled by soil experts – a whole different industry. Personally I like the TGA Standard because it’s a practical and helpful tool for anyone involved with growing, selling or specifying turf. What is covered by turf quality standards? The TGA Standard for Quality Turf looks at the health, handling properties and appearance of cultivated turf. It also looks at the grass species that are present in the turf. That’s important if you are buying turf. It helps you decide which turf grade is right for your project. 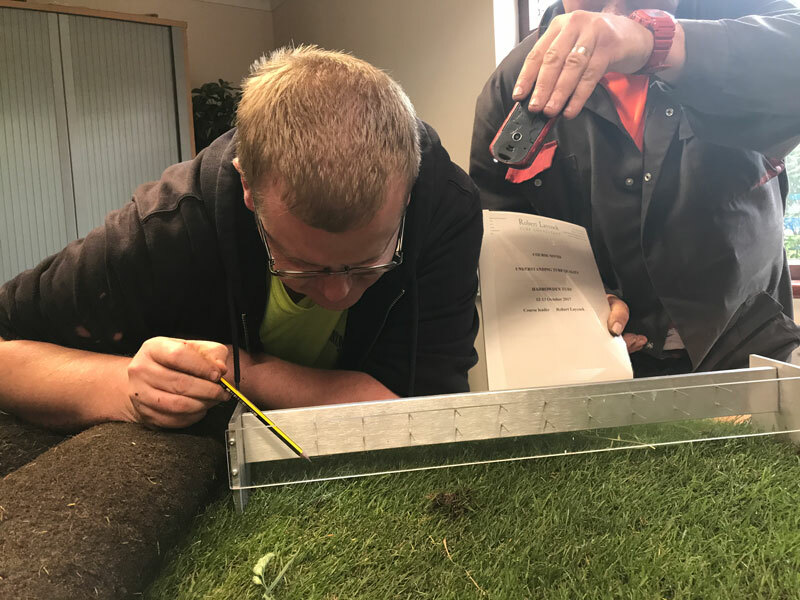 October’s training course means that everybody at Harrowden turf who influences turf quality or who helps customers to decide what they need, is very much able to assess the turf quality. We’re really proud of that. The training course was intensive but thorough. Working in small groups – there were 6 sessions in all – course leader Robert Laycock taught us how to identify grasses from just the leaves and roots. He then showed us how to examine a field, or a consignment of turf and record all of the important measurements. Each group was made up of a mix of colleagues from management, sales, harvesting and production teams. That dynamic mix of people emphasised the importance of the TGA standard from all perspectives. At this point, I should tell you a bit more about our trainer, Robert Laycock. Robert Laycock is an independent turf agronomist working mainly with golf courses and greenskeepers but from time to time he gets involved in dispute resolution. Robert was one of the creators of the TGA standard and more recently helped with the 2013 update to the British Standard BS3969. He’s rarely in the limelight but is one of the most knowledgable turfgrass people I’ve met. If you are specifying or buying turf for a particular project, you can obtain detailed descriptions of any of Harrowden Turf’s lawn products simply by getting in touch. We will send you an up to date TGA certificate by return. To have your consignment checked and certified before it leaves the farm, Harrowden does make a modest charge. However, a certificate for the field being harvested is normally completely free of charge.